I bought some Derwent Artbars on impulse at the Society for All Artists convention in Manchester, England, after watching 5 minutes of an hour long demonstration. It was way too hot in there, and far too many people for my liking, so I had a quick play at the try-it-out table, decided to buy the set of 24, and left. I've been regretting the decision ever since...until yesterday. Derwent Artbars are watersoluble-wax triangular-shaped sticks and are a fairly new product; hence there is not much guidance out there on the web about using them. I have found a few youtube clips showing techniques, but not much about creating a picture. However, once I stopped thinking of the artbars as a set of scary sticks with not enough variety of colour, and started thinking of them as a cross between watercolour pencils and wax pastels, I got on a lot better. I have found the best paper to use is watercolour smooth or almost smooth paper. To begin with, I use the artbars like watercolour pencils - lay down some colour and wash it around with a little water on a brush. Beware though, unless you use the artbars very softly, your marks do still show after the water has been applied. This can be good so long as you apply it carefully and don't just scribble your colour anywhere! 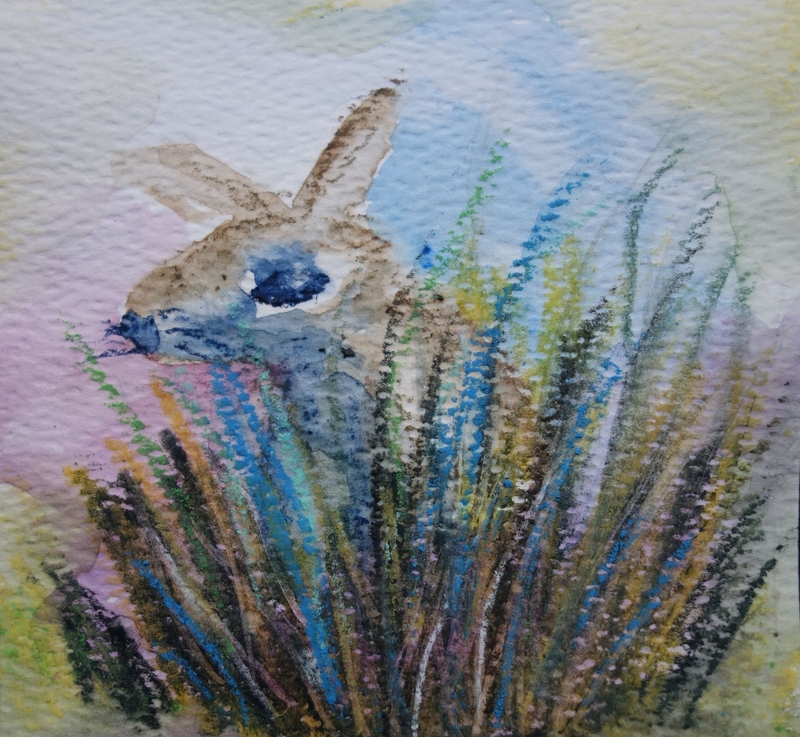 The first of my pictures is a rabbit. I created him using an initial wash, and then built up layers of grass - yellow first, and then darker colours on top. Then I picked up the scraper tool and scratched off to reveal the other colours underneath - much as you would do with a child's firework picture using wax crayon and a pin. Remember those?? 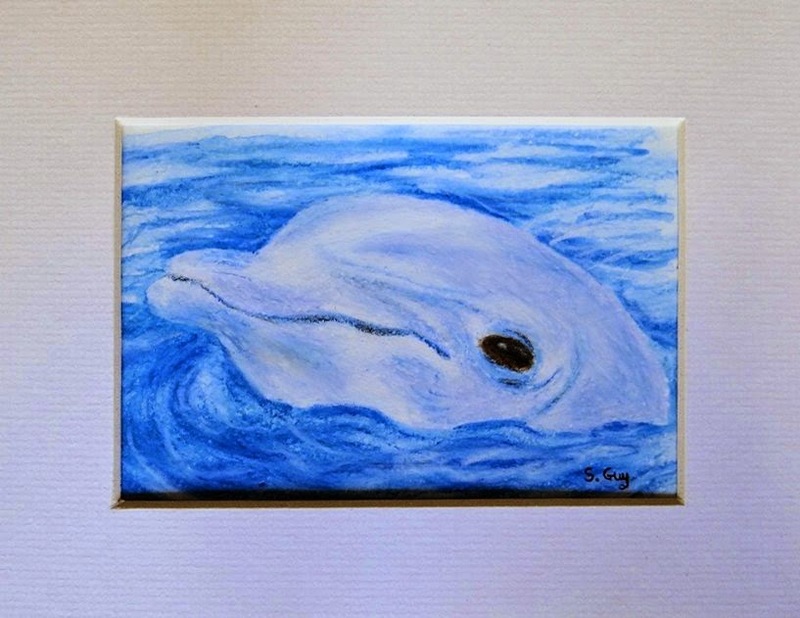 The final picture I'm going to show you today is my dolphin. To begin with I put marks on the paper with the artbars, following the shape and highlights of the dolphin and the water, then I carefully washed these in using a small amount of water. From then on I used the artbars like pastels. The key to getting them to blend well is warmth, if the atmosphere is not warm, they will not blend. This is why I found them easy to use in the hot convention room, and was struggling in my typical English Summer kitchen! Take them to Costa Coffee, where it is roasting hot, and they worked like a dream!! I hope that this blog has been helpful to other people who, like me, are finding the artbars a challenge. I recommend you throw your inhibitions to the wind and have a go! Interesting blog, in my recent experiments I found smooth paper much more successful than paper with texture too. Love the dolphin! Must get painting with my artbars while it's still summer, by the sound of it I might struggle with them in winter!